The 10 Best Places for Mac and Cheese in Michigan! Macaroni and cheese, ladies and gentlemen. Whether served alongside barbecue, meatloaf, or even by itself, this tasty dish connects to our childhoods, and many a great memory of delicious meals. Whether cracking open a blue box or going fully upscale with additions like lobster, macaroni and cheese is delicious, but when it's done right, it's unbelievable. Here are the 10 best places to grab that cheesy delight in Michigan! Featured on an episode of “Diners, Drive-Ins and Dives,” Clarkston Union Bar & Kitchen in Clarkston represents some of the best mac and cheese around. Featuring a variety of preparation methods, including with ham, lobster, and jalapenos, the base version involves both Vermont cheddar and a Pinconning under a crust that's said to be delectable. Clarkston Union Bar & Kitchen has so far served around a million orders of the stuff so far, and the recipe was part of an espionage plot that could have made a movie in its own right. Sweet Lorraine's offers 15 varieties of mac and cheese. Starting with the classic and four cheese options to a pepperoni pizza, fajita, and Cajun shrimp version, you'll have most any kind you want here. Want it on bread? They'll do that too. Want something lighter? Have a salad or wrap instead. Sweet Lorraine's has you covered. Head to Blondie's Food & Spirits in Flint for a taste of some terrific mac and cheese. 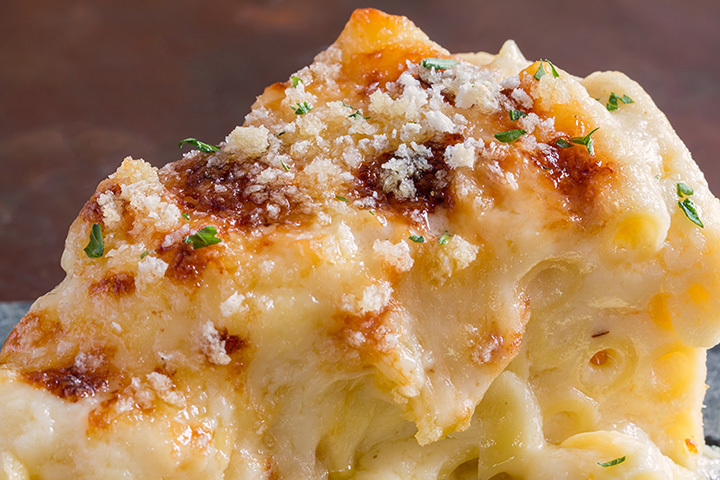 Featuring a house-made Gouda cheese sauce, and served with one side, Blondie's patrons can opt to add bacon to the mix, or even “roasted root veggies” for a little salve to the conscience for eating nothing but mac and cheese for dinner. It's part of a larger array of comfort foods, so those who come in to Blondie's for a mac and cheese lift will likely spot some other options on the menu for later. Grand Rapids' Twisted Rooster—though it has other locations in Chesterfield and Belleville—is well-known for its craft cocktails and welcoming atmosphere. It's also known for its mac and cheese that can get incredibly complex. Drawing on several different and downright unlikely cheeses—starting with cheddar and parmesan but seguing into cream cheese and Velveeta—it then throws in peas, tomatoes, and smoked chicken under a bread crumb crust. It's hard to pass up an array like that, and Twisted Rooster's got it. Eat your mac and cheese off the back of a truck! That may sound bizarre, but some of the best around can be had via the Mac Shack's food trucks in Madison Heights. With eight different kinds available in vegetarian, spicy, and meat-filled varieties, you'll have your choice of a lot of exciting mac and cheese options here, including one version, the Amaze Balls, that comes served as a deep-fried ball. Midland is home to Annabelle's Own, part of a seeming bloc of mac and cheese options in the Tri-Cities. Annabelle's Own focuses on one key concept with its mac and cheese design: “If it don't string, it ain't right.” Thus, Annabelle's Own goes hog wild with the cheese, featuring cheddar, Swiss, American, Monterey Jack, mozzarella, and even cheddar powder. It's then topped with both Monterey Jack and cheddar Jack to round it out, and several other varieties including bacon and Gorgonzola are on hand. Kalamazoo's Food Dance is well known for its breakfasts, but it won't leave you hanging when the morning fades away and it's time for lunch. Food Dance has two versions of the dish: the Classic, which starts with rigatoni, then adds cream, Grafton cheddar that's been aged, and bread crumbs. A sound enough option, but then the Ultimate kicks in. The Ultimate takes the Classic's base and add caramelized onion, fresh spinach, and bacon made in house to complete the package. The Fenton Fire Hall in Fenton isn't just about fire, though admittedly, it started out as just that. Today, the Fenton Fire Hall both celebrates its roots and delivers some impressive food in the process. With a few different versions on hand—one of the most popular is the Yeti Mac that eats like a breakfast with link sausage, maple bacon, and a fried egg along with pickled chiles on top—there's even a rotating specialty version that's different every day. Since this is owned by the same people who own the Clarkston, it's easy to see there will be choice mac and cheese on hand. Even the Upper Peninsula gets in on the action here thanks to the Stonehouse, an Escanaba favorite that delivers a wicked mac and cheese punch. Starting with a ziti pasta, the noodles are then doused in American cheese along with a Morney sauce, which is a Bechamel sauce that boasts Gruyere, Emmental, or white cheddar cheeses. Round it out with Swiss cheese and bread crumbs, then serve it in an iron skillet and you've got a look at what the Stonehouse can do. Chelsea's Smokehouse 52 illustrates clearly that mac & cheese is a distinct part of a real barbecue experience. With three different kinds available—one boasts beef brisket, while another takes on fried chicken and buffalo sauce—it's clear there's no shortage of variety here. Naturally, it's not just the mac and cheese, but everything else that makes Smokehouse 52 stand out. You'll definitely want to get in on the mac and cheese, though.